As I was on the show floor at NAB this week, I heard the news that Sydney Harman had passed. He died Tuesday night in Washington at the age of 92. The cause was complications of acute myeloid leukemia, according to a statement by the family. As long as I or any of my colleagues have been in this industry, our tenure pales in comparison to the career of this truly iconic figure. Sydney was not just a CEO. He has a tireless leade r in the community he lived in. A philanthropist. He was involved in politics– in the best sense of that word. Harman oversaw the building of so many brands in our industry, I would not know where to start describing them all. And he understood that the market was not just about pro audio. Or just about consumer audio. He understood the global, and multi-level nature of modern markets. And he knew that when acquiring a company was a good idea, it was also a good idea to let the original managers run it as a separate entity, keeping an entreuprenarial spirit alive. Washington--Sidney Harman, longtime industry legend and founder of Harman Industries, died, here, last night of complications from acute myeloid leukemia at the age of 92. The news was reported earlier today by The Daily Beast, the online news operation that merged with Newsweek, which he purchased last year. A family statement said that Harman died "at the young age of almost 93," and first learned of the illness a month ago. He leaves behind his wife, former Rep. Jane Harman (D-Calif.), two children, Daniel and Justine, and two children from a previous marriage. Harman was executive chairman of Newsweek and chairman of the Academy for Polymathic Study at the University of Southern California. Funeral arrangements will be private. Memorial services will be held in both in Washington and Los Angeles, at dates still to be determined, according to the statement. As his obituary in the New York Times illustrates, much of the consumer media coverage of Harman's life surrounds the last big achievement in his long and varied career - acquiring Newsweek for $1 and reportedly $47 million of liabilities in August 2010 from The Washington Post Company and merging with the Daily Beast. But for members of the CE industry and audiophiles everywhere his late-life media entry was just part of the story. 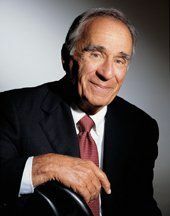 Given Harman's long and innovative career in the industry he was a member of the inaugural Consumer Electronics Association's (CEA) CE Hall of Fame in 2000. At the time of his death he was also chairman emeritus of Harman Industries. In a prepared statement Gary Shapiro, president/CEO of CEA, said, "Sidney was a true industry leader who revolutionized the music industry. He was one of the inaugural inductees into the Consumer Electronics Hall of Fame in 2000, an award that commemorates the impact icons like Sidney had on our industry. With the passing of Sidney, we have lost a good friend and mentor." The biography of Harman on CEA's Hall of Fame site said his career in CE took off in 1953 when Harman partnered with Bernard Kardon and "helped define the home hi-fi industry" with the development of the first receiver. Harman bought out his partner in 1956 and then expanded Harman Kardon. In the early 1970s Harman began experimenting at his Tennessee factory with a management technique. Nicknamed the Bolivar Project, it involved cooperative labor-management of the plant in which workers set their own schedules and goals. The national publicity from the project led to Harman's appointment as Undersecretary of the Department of Commerce during the Carter administration, the CEA biography noted. When Harman moved to Washington in 1976, he sold his company to conglomerate Beatrice Foods but in 1980, after leaving government service, he pieced together Harman International Industries by reacquiring a number of the businesses he had sold to Beatrice including JBL, Harman Kardon and Infinity and Epicure loudspeakers as well as other brands in the professional market. Harman International expanded into the automotive market with car speakers. Harman acquired a $5 million business from the wire division of United Technologies and in five years transformed it into a $100 million business and became a leading speaker supplier to the automotive OEM market, according to the CEA biography. Three years ago in April 2007 Harman and the company board signed an agreement to sell Harman Industries to Goldman Sachs and Kohlberg Kravis Roberts & Co. for about $8 billion, but the deal fell through, due to a variety of factors in September of that year. Harman retired from Harman Industries in 2008 when he was succeeded by current chairman, president and CEO Dinesh C. Paliwal who joined the company in 2007. Paliwal said in a company statement this afternoon on Harman's passing, "His legacy of leading-edge innovation and premium quality will continue to live on at Harman and I am grateful to Dr. Harman for the trust he placed in the company's management to carry on his legacy.He will be remembered for his great charm, his curiosity, his philanthropic and public service interests, his genuine kindness to employees and customers alike." In an exclusive interview with TWICE senior editor Joe Palenchar in August 2008 around the time of his retirement, Harman discussed making technology easy to use and understandable for consumers - something that the industry often forgets: "Technology is there to serve the customer, not to terrify, not to intimidate the customer. That's a mindset of colossal importance. If management and engineering believes it's there to show off how damn smart we are, you get a product with so much complexity that it baffles the consumer." But as his acquisition of Newsweek and subsequent merger with the Daily Beast showed, Harman was far from the retiring type. To illustrate his impact on his new colleagues at Newsweek click here for a remembrance by journalist Jonathan Alter. Harman's book "Mind Your Own Business" was published in 2003. In an excerpt on leadership that TWICE published that year, Harman wrote, "The leader inspires. People want work to be more than drudgery. They want to see meaning in their jobs that justifies and warrants the hours they devote to them. Inspiration promises something beyond wages-a sense that the company has a greater meaning, its own values, and its own reason for existence. A leader must find the way to deliver that message and keep on delivering it."